If you have any questions or want to enquire about dates, use our form to contact Clare Howarth or see their website for more information. In the lush countryside outside of Chantilly – famed for its château, horse racing, lace and cream – lies a typical village house in unusual style. Clare’s creative energy swirls around in the bold cubes and stripes, trompe l’oeil tiles, designer chairs and leafy plants. Carlos crafted the solid wood kitchen table at which you breakfast on home baked goodies, fresh fruits and juices from the village bakery or dine on a light charcuterie platter and a glass of good wine. Cats snooze by the fireplace in a light-filled sitting room bright with paintings by artist friends. And you will sleep well in one of two exquisite bedrooms overlooking a beautiful garden. Dinner with wine, €25. Restaurants 15-minute drive. Our family (including two boys 10 & 12) had the most lovely stay for 3 nights. Absolutely delicious home-made and healthy breakfasts and dinners in the beautiful garden with her family, and excellent advice on where/what to visit (for children and adults) was spot on. The house and rooms are stunning with a great deal of thought put into them and we would definitely return and recommend it. Clare was a fantastic host. 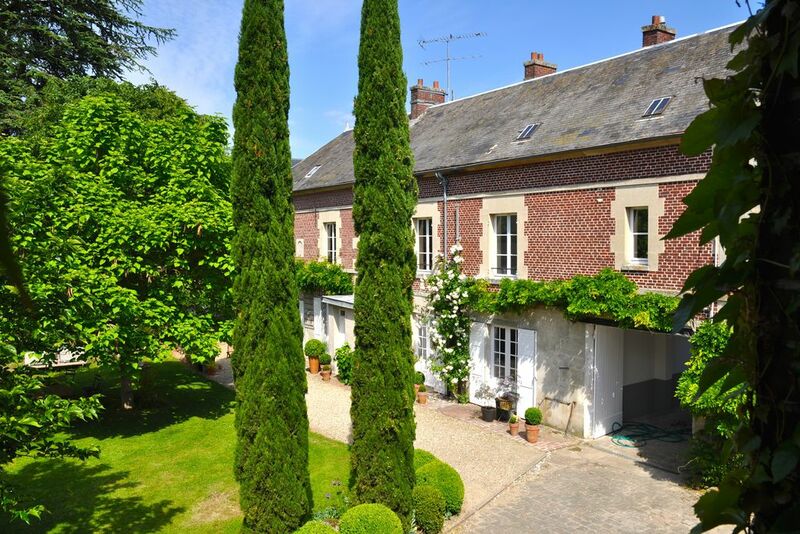 Clare Howarth's lovely home is conveniently located near Chantilly which a short drive from Charles De Gaul Airport. Clare has recently opened her B & B and her generous welcome and well appointed rooms would suggest that she will have much success in her new endeavor. We called only two days before our stay and she was happy to have us on such short notice. We arrived late in the day having not eaten lunch. She immediately set a table with cheese, bread, and fruit for us. As we ate she invited us to have dinner with her family. She is a generous, interesting, and kind host, none better. Drop by Senlis and wander the ancient streets, alleys and gardens within the medieval walls, step inside one of the most beautiful gothic cathedrals in France, test the great speciality food stalls and picnic by the ramparts! We're only 25 minutes from Paris on the train, so go as the locals do and wander the city knowing you will arrive back to peace and nature at the end of a great day in the lively hubub of "the city of light"